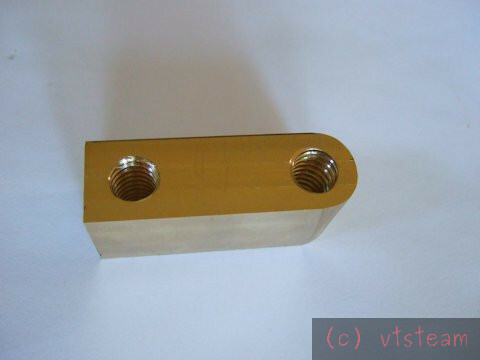 A rough and ready tap for single use can be made easily from mild steel, then case harden it. Turn a length of rod to the acme profile you need, taper one end for a lead in, mill four slots axially to provide cutting edges, then case harden it. This will give a tap with no 'back relief' - so will be easiest to use if you first rough out the female thread by boring, then finish with the crude tap. If you have no case hardening compound, a reasonable substitute is ordinary table sugar. Heat the steel, plunge into sugar bowl whilst wife is not watching, remove, dip in clay slurry, then heat to cherry red. Keep at heat for a couple of minutes, then plunge vertically into water. The clay slurry markedly reduces the oxidation. Keeping vertical reduces distortion. 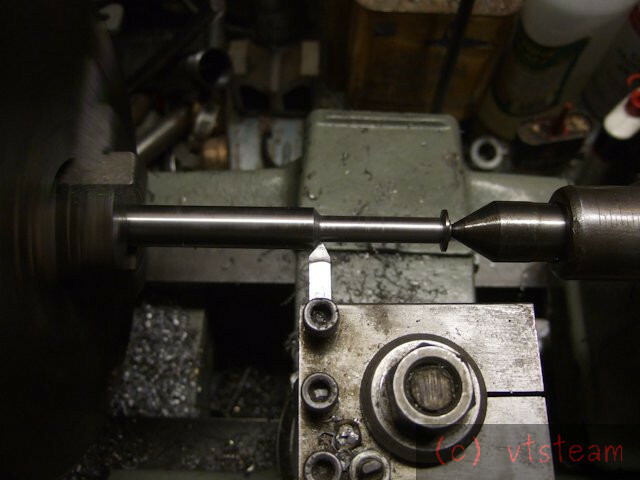 Drill rod makes excellent taps , the easiest way I have found to cut acme threads , is to make a parting tool to fit the thread from round high speed steel , and twist the tool to match the rake of the thread , and a very small in feed . Those are both really great tips. Thanks Guys! I suppose I could make the acme rod to then make the tap. Before I read the above today though, I already made up a second internal threading tool and set up the lathe for thread cutting. I haven't cut anything yet and will try some test pieces tomorrow. I guess I'll see that through, one way or another. But now have a plan B with the tap tips. Also, I should admit, Andrew, I have an unused can of Kasenit sitting on a shelf. 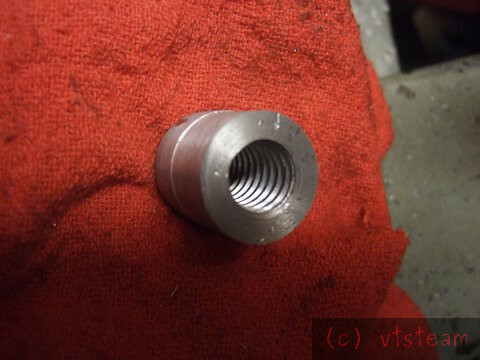 I made one of Bogs tools and found that there was not enough clearance for a coarse thread , and had to grind the front back for 1 1\8 x 11 tpi faceplate , took me a while to figure it out lol . Even if this new tool works out, I gotta try making a tap, the way you guys suggest, too. I'm sure it will come in handy, and I have the materials for it, plus the lathe is set up for cutting 10 TPI. It just sounds like fun to me. And I want to try that hardening recipe. Maybe I'll do 3 of them -- then I can try Andrew's hardening mix, try Kasenit, and also do a drill rod version. Cool! Width of cutter tip was turned to .032"
Diameter of hole to be bored in the nut .420"
Diameter of full cut .520"
Please let me know if any of this is wrong! Steve, I seem to remember that ACME is usually symmetrical, so you can use your existing lead screw as a gauge for grinding your tool, just slightly truncate the male and take the female a tad deeper. A lot of mistakes today -- one of those days. The first and biggest blunder was misinterpreting a drawing in an online diagram and thinking the half angle was 29 degrees for acme threads instead of the full angle. 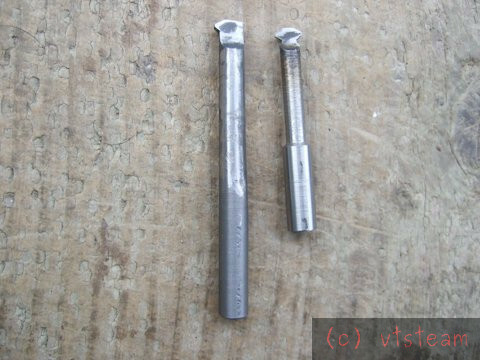 Therefore the two cutters I had made yesterday were scrap. The second was finding an 12" piece of 1/2" drill rod and deciding to use that instead of the newer 3' stock. I made up a new cutter with the correct 14-1/2 degree half angles, milled the flat, and then attempted to harden it. No go! It just wouldn't harden. 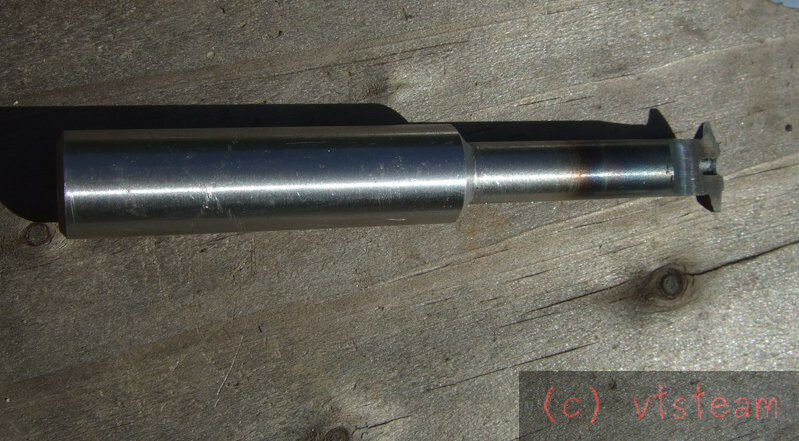 Not sure what it is but it isn't drill rod -- or how I even came to have it -- it appears precision ground, not cold rolled, and certainly not hot rolled. But just wouldn't harden. Third problem: So then I broke out the Kasenit to try case hardening, just for the heck of it. Did that twice, but the depth of case wasn't impressive. Fourth problem: decided to just practice with what I had on a piece of aluminum (former sprue). The lathe was already set up for cutting 10 TPI. But the new cutter just wouldn't cut. Edge seemed sharp, so I guessed there wasn't enough relief under the cutting edge. I had cut the flute flat (?) about ten thou under the center of the diameter, but that didn't provide enough relief. Since the case was so thin, I was able to just file more relief under the cutting edge, and finally the cutter began to work. It was pretty much the end of the day, but it was good to see swarf coming out of the scrap piece as it turned and the thread deepening with each pass. Fifth problem: I hadn't bored a reference land at the start of the hole to indicate when threads were at full depth, and i don't have a piece of acme rod to test (the cross slide screw was being used!) so I just stopped cutting the thread at an arbitrary point. Here's a pic of the practice piece. 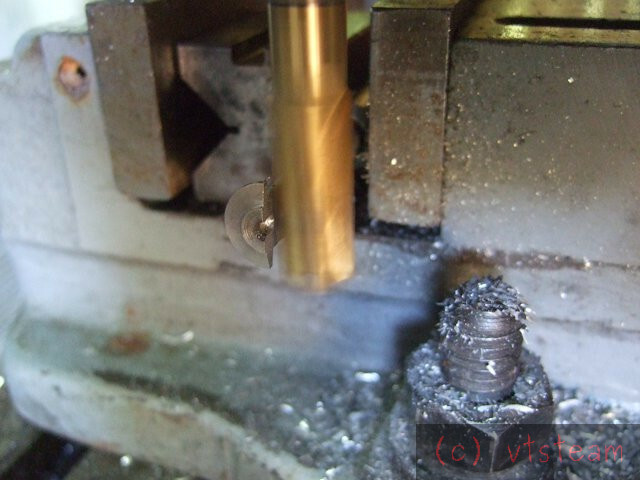 Tomorrow I will make one more new cutter from new drill rod, and file clearance in before hardening. Long day today, but by the end, the beginnings of an internal acme thread from a homemade cutter. So not so bad after all. Now that you have all those out of the way you can get down to some serious work tomorrow. It happens to all of us occasionally if we are honest enough to admit it. Did you cut from the chuck out of from the back of the blank inwards , I only ask because I have not cut a left hand thread yet ? Don, thanks for the encouragement! I'm ready to cut serious metal today!! Or as serious as I ever get. 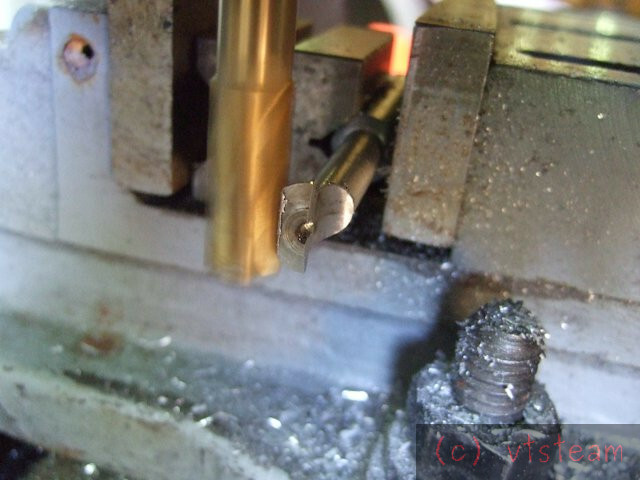 Chipenter, no, I cut from the tailstock end into the piece, right to left. I was kinda confused byt this, and the link to the taps you gave earlier -- left hand taps. Why all this left handed talk? So today I decided to check my cross slide screw. Sure enough a left hand thread. The Gingery lathe I built had a right hand thread for everything -- naturally because it was made out of common all-thread. I just assumed the Craftsman was the same. .........Wrong! I'm not sure if I'm up to plan F yet, but feels like it. 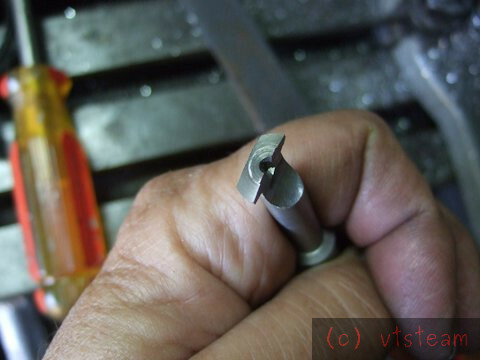 Luckily a lathe threading tool can cut either way, unlike a tap. Although it is handed -- inside vs outside cutting. Anyway, started on the new tool. This time I decided to reduce a portion of the shank to .315, while leaving the bulk at .5. I realized it would fit my boring tool holder, and didn't need to fit the .375 slot in my regular lathe tool holders. The 5/16" section seemed to be the maximum diameter possible to provide clearance for backing out of the groove and returning the tool to start while threading, based on my other tools. Fluting the cutter. This time I milled to the center, and decided I would add more relief later, rather than milling below center. After milling. There is still too much material on the end. Additional relief needs to me removed under the cutting edges because the relief angle is too shallow. When I got close to no more blue, I switched to a bench stone and took the last of it off. Then it was time to harden the cutter. This went without a hitch with REAL drill rod, and a file couldn't scratch it. I left it full hard, as none of my earlier trials yielded a broken cutter -- screw cutting happens at slow speed with light cuts and they aren't interrupted. Maintaining the keenest possible edge is important, so that was my choice. I left cutting edges at both sides of the tool for the time being, since I though I'd try cutting a tap with the outside facing lip. After that I planned to grind it off so the cutter could fit the bore when internal threading. Cutting a tap proved impractical with this tool. 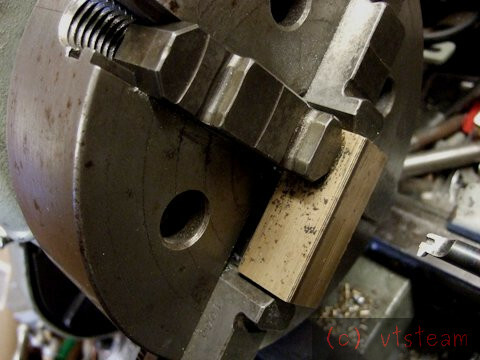 The boring tool holder was in the way of either the chuck or the tailstock since this is a tool designed to be aligned parallel with the bed. 1/2" tap stock had too long an overhang to be solid enough on my lathe without support by the tail center. Low speed chatter was the result when trying to thread drill rod. It left a horrible finish. Much better would be a conventional lathe tool, ground to do a 29 degree thread. You would have a shorter tool extension, plus support by lathe centers. So after fooling around for an hour or so I finally gave up and ground off the extra lip. I did a practice piece in both aluminum and brass, left hand internal threads, and finally chucked up in the 4 jaw the stock I intend to use for the actual leadscrew nut. A old scrap block of either brass or bronze, I'm not sure yet what it is. I'm thinking bronze -- need to clean it up more to see the true color. It's acting like bronze -- maybe even aluminum bronze as it was quite tough to drill. I figure I've got two chances with this block -- the hole I drilled is near one end. If I screw up screwing, I could try again at the other end -- it's long enough to cut off the mistake and try again. The day's about half over and I still haven't cut that nut. A bit frustrated. I tried one more test piece -- seemed perfectly cut, no mistakes, put a bore on the end to tell when cut to proper depth, reverse thread 14-1/2" degree grind, new cutter, etc. But it wouldn't screw onto the cross slide lead screw. I decided I wanted to measure that screw, but it's well buried in the cross ways. I tried removing it but it's trapped by the the drive gears, and to fully remove It I'd have to loosen what appears to be a 1-5/16" hex on the support spigot. I don't have a wrench that size. Then an Idea! What about the compound slide screw -- could that also be a 1/2" 10 TPI acme? Yes indeed! And I can get it out much more easily. Finally I have it, and measure the OD which is a thou under 0.5" -- that's okay. And the thread depth which was about 0.407" also good. I was cutting the thread to .420 and .520. So the lathe has a left hand thread on the cross slide and a right hand screw on the compound slide. No wonder I sometimes get mixed up turning dials. Well, then, I thought, you did make a right hand nut by mistake yesterday, try that on the compound screw. But no, something is wrong, and so far I'm not sure what. But finally I have a sample of the acme thread that I can check the cutter profile against. I can also use it to make a conventional lathe tool in case I finally have to resort to making a tap. Man what a time waster this has been! I checked the threading tool against the compound slide's acme thread and the fit was really good. No play at all and the end of the cutter bottomed out perfectly in the thread. So the profile wasn't the problem. 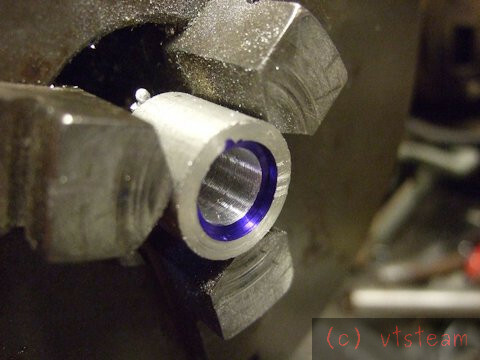 I decided to try one more scrap piece of aluminum, and this time not only cut a register in it, but also blued it so I could see for sure when the cutter touched the outer bore. This one took a lot longer to thread -- which was a hint that the others were indeed too shallow. When it was done I also measured the inner bore -- I had bored .420, but when measured after threading, it was .410. 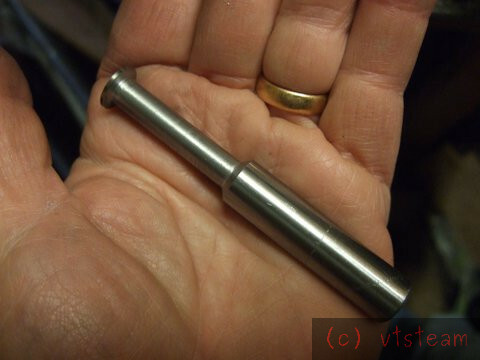 I think the aluminum burred outwards -- I used a round file to bring it back to .420. When I tried it, the scrap piece threaded on the acme screw -- finally! Well, most of the way. I think the thread was still a little shallow at one end. So I realized I probably needed to make a few more spring passes to clean up the end of the thread. Small holes like these necessitate slender boring tools, with a fair amount of spring. The fit was quite good otherwise -- no apparent backlash when wiggled. So I think I have the problems all figured out. This would all be a lot easier if I'd had a piece of left hand acme rod to test the piece as I threaded it. I could just thread until I had a good fit, rather than watching a register. 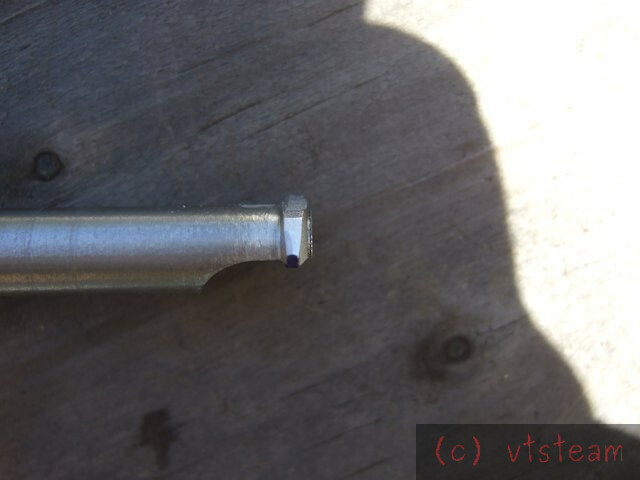 With the register method, you only have one shot to get it right, because you have to remove the nut from the chuck to try it on the lead screw. It can't be threaded any deeper on the lathe after that. Anyway glad to have some answers to the problems. Before starting this morning, I thought I'd give myself some extra insurance by calculating what the compound slide should read when the thread is fully cut. Well, in an ideal world anyway. Because I'm cutting this thread using the compound set at 14.5 degrees, rather than the straight in method, each division on the compound does not equal the actual distance cut straight in. To calculate the difference, I figured it would be the inverse of the cosine of 14.5 degrees times the tooth depth I want to cut. The inverse cosine of 14.5 degrees is 1.033 and the tooth depth is .05" so 1.033 x .05 = .0516". Round that to the nearest thousandth and it's .052" So as a check on the depth of cut, I should be turning the compound slide in a total of .052" on its scale. If I've done that, and I'm also starting to cut my register on the part, I should be at full depth of cut. It took one messed up hole when I got out of sync threading, but there was enough stock to make two. I'll cut the mistake end -- the square one -- off and fit the other to the boring table. I may try again to make a tap, as long as I have the lathe set up for threading. Well done Steve. It all came right in the end due to doggedness on your part. I knew that you were going to stick with it until you had it dancing your tune. Fine job.